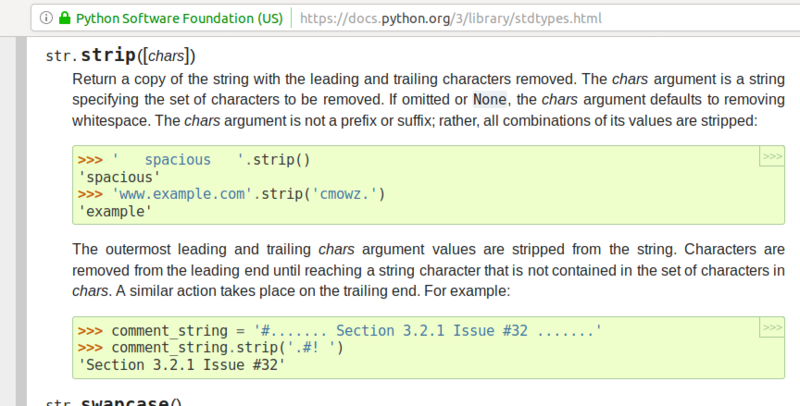 If you see the Official Python3 documentation for strip(), it says that strip without parameters will return the string without the leading and trailing white spaces. Optionally you can pass a string with the characters you want to eliminate. 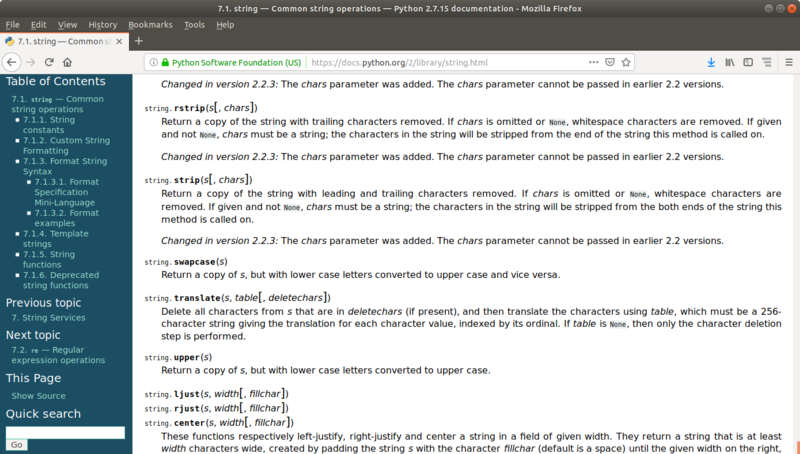 Return a copy of the string with leading and trailing characters removed. If chars is omitted or None, whitespace characters are removed. If given and not None, chars must be a string; the characters in the string will be stripped from the both ends of the string this method is called on. Changed in version 2.2.3: The chars parameter was added. The chars parameter cannot be passed in earlier 2.2 versions. A white space is a white space. Is not an Enter. 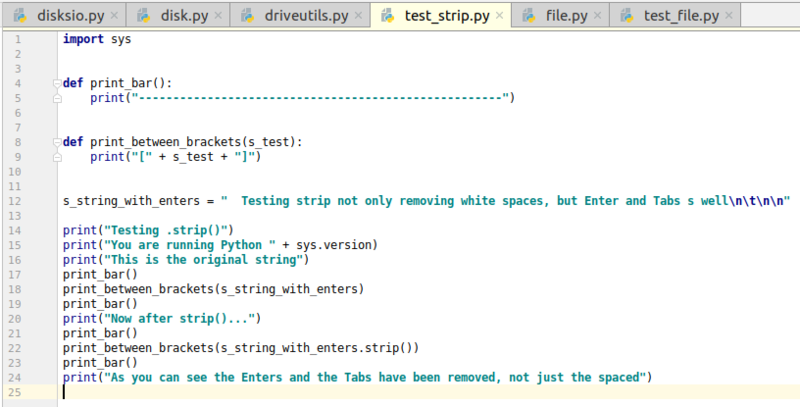 But strip() without parameters will remove white spaces (space), and Enter \n and Tabs \t. Probably you will not realize that unless you read from a file that has empty lines at the end for a reason, and you use strip(). You can see a demonstration following this small program, that runs the same for Python2 and Python3. The [ ] characters where added to show that there are no hidden tabs or similar after. 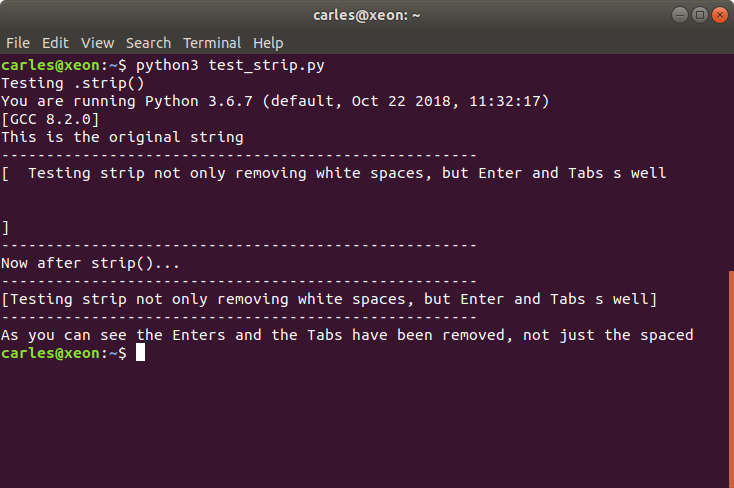 s_string_with_enters = "  Testing strip not only removing white spaces, but Enter and Tabs s well\n\t\n\n"
The issue was registed and made specially interesting contributions by Dimitri Papadopoulos Orfanos. The thread is really interesting to read. I recommend it. The ticket was opened the 2015-10-18 12:15. So it’s a shame the documentation has not been updated yet, more than 3 years later. Those are the kind of things, lack of care, that I can’t understand. Not looking for the excellence. Please, do note that Python3 supports Unicode natively and things are always a bit different than with Python2 and AscII. This entry was posted in Development, Troubleshoot and tagged Curiosity, Python, Python 2.7, Python 3.6 on 2018-11-27 by Carles Mateo. PrototypeC - A cheap tiny portable Linux laptop that weights 160 g.
MySql Proxy Cache - A High Performance TCP/Ip Proxy Cache for Mysql, and Query debugger.